The avant-garde and always-iconoclastic composer John Cage shocked and intrigued audiences around the world when he invented the prepared piano in 1940. Presented with the challenge of writing dance music for a small stage with no room for a percussion group, Cage discovered it was possible to create an entire percussion orchestra with just a single instrument: a grand piano. His creation was the prepared piano: a piano that has had its sound altered by placing everyday objects such as screws, bolts, and pieces of rubber on or between the strings. “With just one just one musician, you can really do an unlimited number of things on the inside of the piano if you have at your disposal an exploded keyboard,” he famously stated. And it was precisely this notion of an exploded keyboard that inspired composer, fiddler, and electronic musician Dan Trueman to create a 21st century version of the instrument: the prepared digital piano. His new album, “Nostalgic Synchronic,” explores the vast possibilities of the instrument through a series of eight etudes performed by percussionist and pianist Adam Sliwinski of Sō Percussion. The etudes make use of three major types of preparations designed by Trueman: synchronic, nostalgic, and tuning. And in true 21st-century fashion, Trueman has made these preparations available as an app (or as standalone software) for listeners to download and use on their own digital keyboards at home. In the synchronic preparations, any notes struck within a given chord are gathered and automatically struck on every tick of the keyboard’s digital metronome—until the player strikes a new chord, then the keyboard resets its metronome to that new time and new chord. The entire keyboard can function this way, or particular keys may be selected to be “synchronic,” allowing for an infinite number of accent patterns, melodies, beats, and chord combinations. The nostalgic preparation is a reverse delay that is shaped and constrained by the prevailing metronome pulse: essentially, when a pitch is struck and released, the keyboard samples the note and plays it backwards so that it reaches its mirrored attack in sync with the next click of the metronome. Last is the tuning preparation, which allows the player to switch freely between three different types of tunings during performance: standard equal temperament, just-intonation temperament, and what Trueman calls “partial tuning,” which is based in part on intervals drawn from the overtone series. 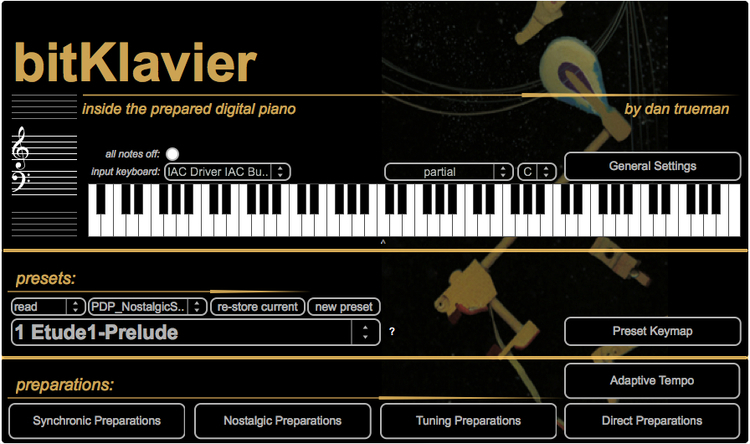 Dan Trueman – The Prepared Digital Piano from Troy Herion on Vimeo. As you can imagine, these preparations allow for infinite musical possibilities—many of which are demonstrated in Trueman’s collection of etudes. From the persistent rhythm and the spacey, sliding sonic structures of “Prelude” to the repetitive melodic figures and jagged chord clusters of “Song,” each piece explores the breadth of textural and timbral possibilities on the instrument. In fact, “Undertow” sounds almost as though the pianist is exploring the instrument for the first time—with fingers curious and gentle, listening intently to each note as the tunings echo and shift. By contrast, “Marbles” is a glitchy, jittery little jig that sounds almost like a toy piano or a vintage video game—that is, until the growling bass rolls in. “Wallumrød” mixes jazzy riffs with the sonic sway and reverse fade-attack of the nostalgic preparations, while “Systerslått” takes its mysterious tunings, wobbly groove, and folky ornamentation from a Norwegian fiddle tune. The album ends with “It is Enough!” a slow and gentle tune that twinkles like a music box—you know, if that music box was filled with echoes of electronically-manipulated melodic fragments. So forget what you know about classical harmonic progressions—you’ll find no reassuring V-I on “Nostalgic Synchronic.” But what you will find is someone willing to start all over, to rediscover a tried-and-true instrument and create something entirely new. After all, who says piano keys have to be just black and white?